Mr. Patric is a farmer from Basavanagudi village, P G Palya Gram panchayath, Kollegal Taluk, Chamarajanagar District. He is 48 years old and has studied up to 10th standard. He is a member of Santha Josef men’s Self Help Affinity Group which was formed on 17.01.2004. His wife Ms. Mykal Mary is aged about 45 years and has studied up to 7th standard. She helps her husband in Agriculture, maintenance of cross bred cows apart from household work. They have two children. The son Mr. Pascal Viktor is 22 years old and studied up to 2nd PUC (Pre University Course) and discontinued his education, but he is interested in dairy development and is supporting his father in Agriculture and dairy development. The daughter Ms. Shyni Juliet is aged about 20 years and studied PUC, D.Ed (Diploma in Education). Presently she is working as teacher in St. Joseph school at Bangalore and gets a monthly salary of Rs.5000/-. She stays with relatives Bangalore. 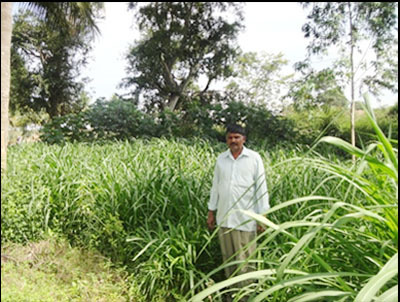 Mr. Patric has 3.5 acres land which is irrigated by bore well and open well. His brother Mr. Joseph is working in Naganahalli, H D Kote taluk as the Head Master of a High school. He also has 3.5 acres of irrigated land which he has given on lease to Mr. Patric for Rs. 25,000/- per year. Mr. Patric is growing maize, potato, beans, carrot, garlic and fodder. There are 12 members in the Santha Josef Group. It conducts fortnightly meetings regularly. The total savings of Mr. Patric is Rs. 16,250/- as on 15.12.2014. The SAG has provided a lot of support to Mr. Patric for Dairy Development and Agriculture. He has taken a loan of Rs. 10,000/- on 15.08.2008 and started Dairy development with one Cross Breed cow. Over a period of 6 years he has taken 12 loans from SAG totalling Rs. 3,69,000/- for purchase of CB cows and development of mini dairy. He now has 18 Jersey cows, 1 buffalo an, 9 calves. 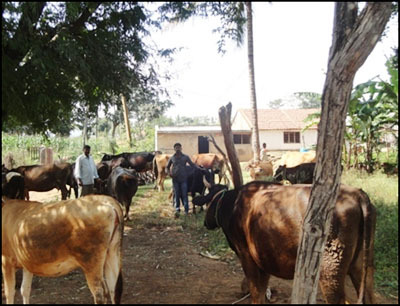 With the support of CMRC Mr. Patric has taken loans of Rs.70,000/- directly from the Bank and purchased 2 Cross Bred cows. All the loans have been cleared and he has established his credit-worthiness with banks. He has been selected for NABARD subsidy scheme for dairy development. 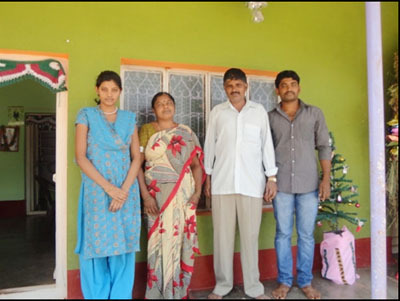 MYRADA and Kalpavruksha CMRC Odeyarapalya have taken the Syndicate Bank Manager Odeyarapalya to Mr. Patric’s land and shown the dairy development. The Bank Manager was convinced and mobilized Rs. 1,25,000/- subsidy from NABARD and Bank has given Rs. 2,75,000/- loan to Mr. Patric, out of which he constructed one cattle shed and purchased 6 more CB Cows. 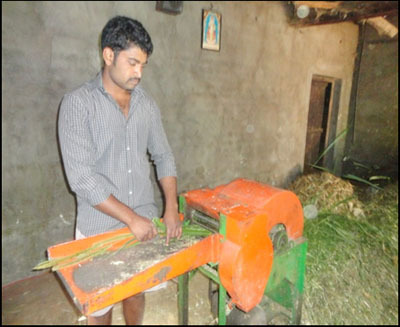 Bank and NABARD Assistance also helped him to develop mini dairy. Mr. Patric has reserved 1 acre land for growing fodder for cows. He also purchases cattle feed from the milk society. He purchased one fodder cutting machine from the milk cooperative society for Rs.13,800/- and got subsidy of Rs. 5,500/-, Use of cutting machine has minimised fodder wastage. Recently one milking machine has been purchased from Milk cooperative society for Rs.17,300/- and of which Rs.12,300/- was a subsidy. This machine helped the family members to save milking time. • His father was keeping some local milch cows during his childhood. He was motivated by his father to continue the dairy activity. • His son has discontinued his education; therefore he wants to engage him in income generation programme. • He has the confidence to mobilize financial support from SAG and Bank. • Good marketing facility for selling of milk in milk cooperative society. 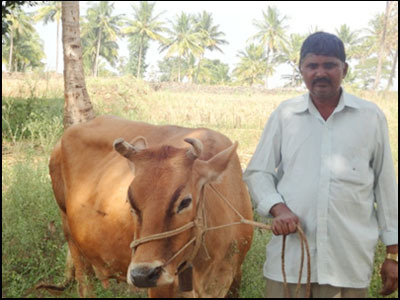 Mr. Patric started the dairy activity with one cow by taking Rs.10,000/-loan from the SAG and increased the number of cows. And selling the milk @ Rs.27 per ltr.  Getting 25 tractor load of cow dung per year @ Rs.2500/- per tractor load. The cost of cow dung is Rs.62,500/-. Some portion of cow dung is used for his Bio gas plant which was constructed with MYRADA support. The remaining manure is applied in his land. Family Health Insurance: Mr. Patric has taken family Health insurance with the support of CMRC and to cover health risk.